Spiral Cellars is the leading expert in wine storage in the UK. On their web site, they have published a list of the Top 10 Wine Destinations. What do you think? Obviously a London-centric selection. Why should you visit? To taste the sublime Riesling – regarded by many experts as the world’s best white grape – and to marvel at its featherweight balance. The scenery is also some of the most beautiful and vertiginous in Germany and will test your calf muscles! Wineries to visit? Dr Loosen, JJ Prüm, Heymann-Löwenstein, Fritz Haag, Egon Müller. Why should you visit? Partly to visit the Port lodges in Vila Nova de Gaia (on the opposite bank from Porto) but also to take the surprisingly cheap train ride up the Douro River to the vineyards where Port and Douro table wines are made. Get off in Pinhão. Wineries to visit? Niepoort, Quinta do Crasto, Quinta do Noval, Quinta do Vallado, Poeira. Restaurant tip? Bull & Bear (Porto). Why should you visit? Adelaide is not as cosmopolitan as Melbourne or Sydney, but it’s the capital of the Aussie wine industry, situated within easy distance of the Barossa, Eden and Clare Valleys, the Adelaide Hills and McLaren Vale. It’s also got a great BYO restaurant scene. Wineries to visit? Yalumba, Shaw & Smith, d’Arenberg, Geoff Merrill, Henschke. Restaurant tip? The Star of Greece (Port Wilunga). Why should you visit? The scenery and the Pinot Noirs, which are some of New Zealand’s best. In a stunningly beautiful country, Central Otago still stands out. Make sure you visit Lake Wanaka, but be sure to hire a 4x4 if you’re going there off road. Wineries to visit? Rippon, Felton Road, Mount Difficulty, Mount Edward, Bald Hills. Restaurant tip? The Beach House (Queenstown). Why should you visit? It may not be the country’s capital, but Cape Town is the centre of the Winelands, ideally situated for Stellenbosch, Constantia, Paarl and Hermanus as well as the vibrant restaurant scene of Franschhoek. The landscape is breathtaking. Wineries to visit? Boekenhoutskloof, Fairview, Ernie Els, Hamilton Russell, Vergelegen. Why should you visit? To eat and drink as well as you will anywhere in France. This is the start of the Côte d’Or, Burgundy’s golden slope, which contains many of the most famous wine villages in the world, such as Meursault, Gevrey-Chambertin and Vosne-Romanée. Wineries to visit? Louis Jadot (Beaune), Domaine Fourrier (Gevrey-Chambertin), Domaine Grivot (Vosne-Romanée), Jean-Noël Gagnard (Chassagne-Montrachet), Ghislaine Barthod (Chambolle-Musigny). Restaurant tip? Ma Cuisine (Beaune). Why should you visit? You might not fancy swimming in the Pacific without a wetsuit, but Santiago is ideally placed between the Andes and the sea. It’s also very close to Casablanca Valley, the Maipo Valley and San Antonio. If you’d got time, head north to the desert, too, although you won’t find any wines there. Wineries to visit? Casa Marin, Errázuriz, Santa Rita, Veramonte, Matetic. Why should you visit? Argentina’s wine capital is a great place to party as well as drink wine. It also has stunning views of the Andes, one of the world’s great backdrops. The city is surrounded by vineyards, but head for the Uco Valley as your first stop. Wineries to visit? O Fournier, Catena, Pulenta Estate, Cheval des Andes, Zuccardi. Restaurant tip? Francis Mallmann (Mendoza). Why should you visit? For sunshine, tapas, flamenco and, of course, Sherry. There are few more enjoyable things in life than sipping a glass of bone dry Manzanilla on the beach in Sanlucar. The Sherry bodegas are worth a visit too. Wineries to visit? Hidalgo, González Byass, Emilio Lustau, Sandeman, Domecq. Restaurant tip? Casa Bigote (Sanlucar de Barrameda). Why should you visit? Visit during truffle season in autumn and you are guaranteed one of the great gastronomic breaks. Alba is the centre of the Piedmont region, home to Barolo, Barbaresco, Arneis, Dolcetto and, er, Ferrero Rocher chocolates. Wineries to visit? Gaja, Giacosa, Conterno-Fantino, Ascheri, Vajra. Restaurant tip? Ristorante Enoclub (Alba). German red wines are increasingly appearing in the international wine market. Of course, given its location, they tend to be not like the fruity red wines we know from warmer countries, but lean and more elegant, with a lot of finesse. 30 years ago, in the international scene, people would not talk about German red wine. But this has changed. Germany now produces red wines that can compete with the best of the world. The share of red wines in terms of production has increased from 10 percent in the 1980s to about 35 percent now in Germany. Reflecting this trend, the New York Times carried an interesting article about a Pinot Noir tasting in New York, organized by David Schildknecht and led by Klaus Peter Keller, the giant wine maker from Rheinhessen and Caroline Diehl, the new star at the famous Diehl Estate in the Nahe. In Germany, the Pinot Noir is called Spätburgunder. It is to red wine what the Riesling is to white wine: the cream of the crop. In the US, Pinot Noir shows great promise in Oregon and California. The reputation that gets Pinot Noir so much attention, however, is owed to the wines of the Bourgogne in France, where it has probably been cultivated since at least the 4th century (first documented, however, in the 14th century). Regardless of where it’s grown, Pinot Noir is not typically a value wine. That is so because Pinot Noir is such a delicate grape that it is difficult and expensive to grow and make into the spectacular wine it can be. It is sensitive to climate and soil, Pinot Noir needs warmth (but not intense heat) to thrive and does well in chalky soils. As the German name implies, it ripens late (spät). I tested and reviewed recently red wines from Huber, Neipperg and von Gleichenstein. See below. Here is the New York Times Article by Eric Asimov. TODAY’S word, people, is spätburgunder. Let’s say it slowly: SHPAYT-bur-GUHN-der. That’s German for pinot noir, and the time has come to say it out loud. Trouble is, in the United States at least, hardly anybody has tasted it, much less heard of it. Most people don’t even realize that Germany produces any red wine at all, let alone some very good pinot noir. Few wine shops carry a selection of spätburgunders, and even those in on the secret may have only one or two bottles at a time. A strong restaurant culture provides a natural setting for showing off a nation’s wine, but German restaurants in the United States have gone the way of the Victrola, beyond a few beer-oriented rathskellers and old-fashioned oompah joints. Of course, the Germanic names and nomenclature work against the wines in the usual way. So I had good reason to be excited last month when two of Germany’s best pinot noir producers, Klaus-Peter Keller of Weingut Keller and Caroline Diel of Schlossgut Diel, came to New York with 19 different spätburgunders from the 2007 vintage. The wines were to be served with dinner at Seasonal, an excellent Austrian restaurant in Midtown Manhattan, in the absence of a German alternative. Now, 19 wines are a lot to think about with dinner, too many, really, for proper evaluation and appreciation. But faced with a drought, a man can’t complain about a deluge. To call Keller and Diel pinot noir producers is a misnomer, I suppose. Riesling is far more important at both houses. By comparison, they make microscopic amounts of spätburgunder, though that may change in the future. Pinot noir production and consumption in Germany has risen sharply in the last 30 years. In 2008, roughly 11.5 percent of Germany’s vineyards were planted with pinot noir, up from 3.8 percent in 1980. German pinot noir may seem like a new idea, but it has existed for hundreds of years, ever since the 13th century when, just as they did in Burgundy, Cistercian monks planted pinot noir vines along the Rhine. If spätburgunder is not spoken of with the same reverence as Burgundy, it’s not surprising. While pinot noir was perfectly suited to the Côte d’Or, it struggled to ripen in the cooler German climate. Until recently, most German pinot noirs were lean and pale. The tangy refreshment they offered was not without charm, but far from the depth and complexity of good Burgundy. You can still find those leaner spätburgunders, and I must admit I enjoy them. But climate change has made it easier for pinot noir to ripen, and not just in Baden, the southernmost German wine region and long the leading producer of German red wines. 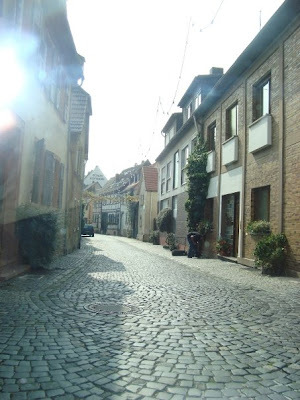 Ahr, northwest of Koblenz, and one of the northernmost fine wine regions in Europe, specializes in spätburgunder. 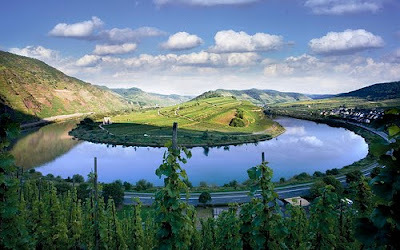 Even the Mosel, south of Ahr but paradoxically cooler, which did not permit the planting of red grapes until 1986, is now a source for some exceptional pinot noirs. The biggest surprise for me at the Seasonal dinner was a Mosel spätburgunder produced by Markus Molitor from the Graacher Himmelreich vineyard, famed for its wonderful rieslings. This was a lovely, delicate, balanced wine with gorgeous fruit and smoke flavors. The dinner was organized by Stephen Bitterolf, wine director at Crush Wine and Spirits on East 57th Street, who is one of New York’s leading proponents of spätburgunder. Mr. Keller chose a sample of German pinot noirs to serve at the dinner. The list was by no means complete — one of my favorite spätburgunder producers, Rudolf Fürst of Franken, was not in the tasting, nor was Meyer-Näkel, one of the best-known producers of the Ahr, whose wines I’ve unfortunately never tried. These were high-end pinot noirs, which, if they were available in the United States, might retail for $70 to $140. They were selected to illustrate the various styles of German pinot noir today. Aside from the Molitor, memorable wines from the evening included the J. J. Adeneuer Ahrweiler Rosenthal from the Ahr, a chiseled wine tasting of minerals and flowers, and the pure, balanced Diel Cuvée Caroline from Nahe, named for Ms. Diel by her father, Armin Diel. August Kesseler of the Rheingau is one of the few German producers as well known for pinot noir as for riesling, and the power of the two Kesselers in the tasting showed a fascinating contrast to the laserlike focus of the Molitor. Of the two, the Assmannshäuser Höllenberg seemed far more structured and substantial than the disjointed Rüdesheimer Schlossberg. They both will need a few years to come together. Some of the spätburgunders indicated a dismaying preference for oakiness and power over purity and finesse. Two of the more popular wines at the dinner were Hommage from Friedrich Becker in the Pfalz, which I found far too oaky, and the Wildenstein Reserve from Bernhard Huber in Baden, which I found overly powerful and unwieldy. These wines will have their partisans, though. I had no such reservations about the two Keller wines served at the dinner, which included the remarkably precise and luminous Frauenberg and the rounder Dalsheimer Bürgel. I was not surprised to learn that among the many places Mr. Keller trained before taking over his father’s domaine in Rheinhessen were two Burgundy estates, Hubert Lignier and Armand Rousseau, renowned for their pure, focused wines. The proof that Germany is now making some exceptional pinot noirs is there for the tasting, if only more people in this country could taste it. Among the barriers to finding spätburgunders in the United States, I forgot to mention one: It’s so popular in Germany, they drink most of it up. Here are my tasting notes of German Spaetburgunder. Der Feinschmecker, the leading German food and wine journal, carries in the November 2009 issue an article about German red wine. Its message is that Germany has established itself as a serious red wine country during the past 30 years. Der Feinschmecker portraits 10 winemakers behind this wine revolution. One of them is Bernhard Huber in Baden in the South of Germany. It is not for no reason that he was Gault Millau’s wine producer of the year in 2007. Tasting Notes: An entry level dry red wine with a lot of finesse from one of the giants of German red wine. Light ruby red. Light aromas of cherry, smoke and wet earth. Good purity of raspberry and cherry fruit on a lean palate. Very well made wine with a persistent finish. The counts of Neipperg have cultivated vines for over 700 years in the wine-growing region of Württemberg. Karl Eugen, hereditary count of Neipperg, has been responsible for the wine estate since 1984. Tasting Notes: A charming entry-level dry red wine from a prominent German producer with a long tradition. Light ruby red. Bright red fruit aromas of cherry and blackberries. Light palate with good concentration of red berry fruit and harmoniously balanced tannins. Long, fruity finish. Good food wine. The Estate of Baron Gleichenstein is all over in the wine press these days because it is this year’s shooting star of the Gault Millau. The Estate is located in the Kaiserstuhl region in Baden, the most southerly German wine-growing area, across Rhine river from Alsace. It is known for its Pinot wines - both red and white. Tasting Notes: Light ruby-red in the glass, with thick legs, attack of wet leaves and leather on the nose, coupled with notes of strawberries and cherries, full bodied on the palate with more red fruit tones, elegant and feminine, lasting finish. I have tasted the whole portfolio of von Gleichenstein wines recently and reported about them here. ProWein 2010 in Düsseldorf - German Wine: Not Just Riesling! Press Release Messe Duesseldorf: ProWein 2010, International Trade Fair Wines and Spirits, in Düsseldorf, Germany (March 21 - 23, 2010) will give visitors a unique overview of the German wine scene. Key producers and all 13 growing regions will be featured at the trade fair. Alongside Generation Riesling, the German Wine Institute will also present cross-winery products and marketing concepts including Ecovin wines for example. Like every year, the joint stand of the leading wine estates association (Verband der Prädikatsweingüter (VDP)) with its around 150 producers will be an attraction for the visitors. The stand has been re-organized for the 100th anniversary – it was enlarged in order to include a tasting zone featuring a cross-section of “100 years of the best wines from the best locations from creative winegrowers”. The joint stands of the different growing regions will offer a variety of presentations. Franconia will include wine producers from the “Frank + Frei” group. The Palatinate will present 25 producers at its joint stand featuring various tasting sessions hosted by world champion sommelier Markus del Monego. Rhine Hesse will be represented by first-class wines from “Selektion Rheinhessen”. At its joint stand, Baden will feature numerous wineries alongside several cooperatives. In Baden, cooperatives and private wine producers have joined together and formed the Badischer Wein GmbH which not only promises a new website presence but also a new stand at ProWein 2010. The Württemberg producers’ stand will primarily showcase 2009 reds due to low white wine production this year. The Trolling–Württemberg speciality with its fresh, fruity and cheeky motto “frisch.fruchtig.frech” aims to appeal to young consumers. Even smaller growing regions like Saxony and Saale-Unstrut have interesting wines to offer. The Saale-Unstrut joint stand will have new arrivals and will be presented together with the Freyburg vintners’ association Winzervereinigung Freyburg and their new Bach wine series. Those interested in “new” wine estates should visit Weingut von Winning (the traditional Deidesheim winery previously known as Dr. Deinhard). Presented under the Villa Heynburg heading at the Hex vom Dasenstein Wine Cellar stand will be an ambitious start-up winery from Kappelrodeck showcasing its first vintage (2008). "The economic crisis has also impacted the German wine market this year," says Monika Reule, Managing Director of the German Wine Institute (Deutsches Weininstitut – DWI) summing up the current climate in the German wine business. "In the first three quarters of this year, wine sales in Germany dropped by 3% across all points of purchase and areas of origin compared to the same period last year. Turnover also fell slightly by 0.7%. Sales of German wines fell in the same period by 6.7% while turnover retracted slightly by 1.9%. However, with a 53.5% market share of total wine turnover, German wines still clearly maintained market leadership at home ahead of Italy and France with each accounting for 13%." Internationally, German wines enjoy increasing recognition – something that can be seen in the stable demand for such wines and their success in international competitions. VDP President Steffen Christmann is satisfied with the development of the association members: "The extremely positive trend over the past few years has put us in a very good starting position in Germany and on many export markets. While the economic crisis did not spare us, business at German Prädikatswein estates is doing very well considering. The quantities per order are decreasing and customers are reducing inventories and investing less in wines they cannot sell immediately. Overall, however, this does not mean that substantially lower quantities of wine are being sold." Less wine than in 2008 but excellent quality: the result is estimated at 8.8 m hectolitres – a figure 10% to 15% under the yield of the 2008 vintage and below the five-year average. Average harvest losses of 23% were the result of uneven flowering, a warm, damp period in summer and – especially in Saxony and Saale-Unstrut – heavy frosts in winter. In these two easterly growing Regions, producers suffered harvest losses of between 49% and 58%. Only Franconian vintners and their colleagues in the Palatinate had fewer losses. Nevertheless, quality has compensated for any quantity deficits. Red wines are as popular with consumers as ever. The proportion of German red wines purchased has risen continually and stood at 43% in 2008 (white wines: 45%). Only ten years ago, this figure for German reds stood at just 25%. Spätburgunder (German Pinot Noir) in particular is attracting increasing interest proving its competitive edge with many international prizes. For example, the Ahr-based winery Meyer-Näkel won the Decanter International Pinot Noir Trophy and the Austrian magazine “wein.pur” used “The best Pinot Noir in the world comes from Germany” as a headline. In the grand 2009 competition for this variety – the ”Mondial du Pinot Noir “in the Swiss town of Sierre - a total of 17 gold medals and two special prizes went to German Pinot Noir wines. The red wine boom of the past few years has stopped in terms of new planting. The only varieties managing to expand in area were whites: Riesling alone posted a 700-hectare increase between 2008 and 2009. Riesling remains Germany’s most important grape variety while Pinot Blanc and Pinot Gris were both able to post considerable area increases. Ever more consumers are turning to Pinot Blanc varieties with total vineyard area amounting to 8,212 hectares – putting Pinot Blanc in fourth position in Germany’s variety ranking after Riesling, Müller-Thurgau and Pinot Noir. The strength of the Pinot Blanc varieties lies in their agreeable acidity and excellent suitability as accompaniments to food. For the first time this year, a special prize for light, fruity and aromatic “summer wines” was awarded by the German Wine Institute as part of the DLG’s National German Wine Awards. According to a survey among wine producers, this category (including not only Rivaner but also white cuvée wines, rosés and light Rieslings with 10% to 12% alcohol by volume) generates more turnover and is promising for export. The market for organic wine is developing as rapidly as ever, says Ralph Dejas, Managing Director of the largest organic wine association Ecovin: “Today we are enjoying a solid and stable climate. 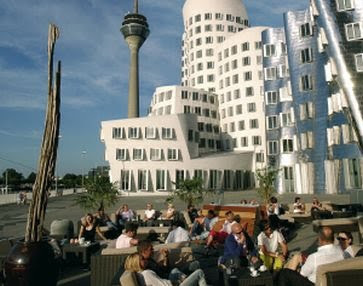 The largest consumer market in the EU is Germany. However, export is playing an increasingly important role for some producers.” The participation of wine growers exhibiting at the ProWein 2010 joint stand will double compared to last year. Two events will be featured at the DWI stand – including a presentation of this year’s eco prize winners. December 2009 saw Ecovin hold the first international competition for ecological wines in collaboration with the MUNDUSvini International Wine Award. According to Ecovin, 4,266 hectares are currently being used in Germany for organic wine growing (542 wineries). 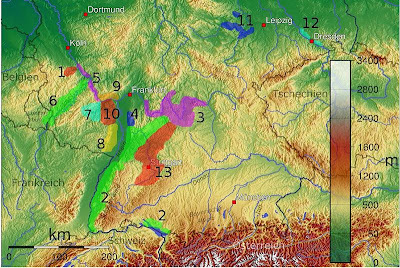 The majority of organic wine producers are located in Rhine Hesse (141 wineries) boasting the largest area of organic grape cultivation (1,699 hectares) followed by Baden (125 wineries with 650 hectares) and the Palatinate (95 wineries with 1,065 hectares). In many wine growing areas, wine producers group together and present themselves jointly. 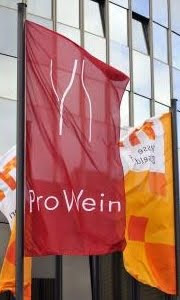 Many of these groups will also be featured at ProWein with their own stand, including Message in a Bottle (young vintners from Rhine Hesse), Frank + Frei (wine producers from Franconia), Südpfalz Connexion and the Barrique Forum (wine producers from several growing regions specialising in barrique wines). New is a trans-regional group of some 80 young wine growers plus “stakeholders in the wine business” named “Generation Riesling” (www.generation-riesling.de). Generation Riesling particularly highlights Germany’s well and internationally-trained, ambitious young winemakers. This group will be present itself at ProWein 2010 at the DWI stand: “The DWI called the Generation Riesling initiative into existence to give Germany’s young, highly-trained and internationally-oriented generation of wine producers a joint platform to present themselves worldwide. While the name does put Riesling, currently Germany’s trendiest grape variety, into the foreground, the group in no way excludes young vintners preferring to focus on other varieties like Pinot Blanc, Silvaner or Lemberger etc. For this reason a wide range of top wines from Generation Riesling will be available for tasting at ProWein 2010,” said Monika Reule, DWI Managing Director. Author Dr. Rolf Klein is co-founder and former editor-in-chief of the wine magazine “Weinwelt” published by Meininger Verlag. 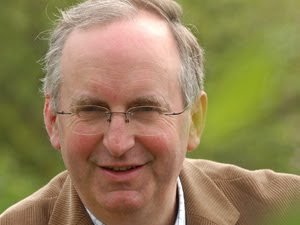 At present, Dr. Rolf Klein works as a freelance wine journalist. Ambitious Rheinhessen, Germany, Winemakers:"Message in a Bottle Group"
The sugar content of the fruit at the point of harvest is at the heart of the German wine classification system. The higher the sugar content in the grapes at the point of harvest, the higher the classification of the wine. There are different approaches for measuring the sugar content, like Celsius and Fahrenheit for the temperature - America uses Fahrenheit, Europe uses Celsius. For the sugar content in the grapes, Americans use the Brix scale, Germans use the Oechsle scale. Based on the Oechsle scale, German wine is classified into nine quality groups, ranging from Tafelwein with the minimum Oechsle degree of 44 to Trockenebeerenauslese with a minimum Oechsle degree of 150. The minimum Oechsle degrees differ somewhat between Germany’s wine regions and between red and white wine. The numbers indicated below are those for the white wines from the Mosel valley. Tafelwein (Table wine) - the lowest German quality class; has to have at least 44 degrees of Oechsle in the vineyard. Landwein (Country wine) - 47 degrees of Oechsle at the minimum. Qualitaetswein bestimmter Anbaugebiete (QbA wine) means a quality wine from one of the thirteen specified German wine regions; close to half of German wine is QbA wine - 50 degrees Ochsle. Kabinett - 67 degrees Oechsle. Spaetlese means late harvest but this are simple wines made from grapes with a higher level of Oechsle - 76 degrees, not necessarily wine made with grapes harvested late in the season. Auslese - 83 degrees of Oechsle. Beerenauslese - 110 degrees of Oechsle. Eiswein - icewine, the same minimu level of 110 degrees of Oechsle. Trockenbeerenauslese - 150 degrees of Oechsle. To be clear: the Oechsle degrees measure the sweetness of the grapes at the point of harvest. But this has nothing to do with the sweetness of the finished wine. Same basics, which are often not well understood, but which are fundamental to the issue: The fermentation of grape must is a complex process in which sugars, naturally present in grape juice, are transformed into alcohol and carbon dioxide by the action of yeasts. During fermentation, the sugar content of the must declines, while the alcohol content increases and the CO2 disappears. Another by-product is heat. This process stops automatically when the alcohol level in the wine has reached around 13 to 15 percent of the volume. If just left to mother nature, such a wine would have a normal alcohol content and would be a dry, like most of the wines in the world. More specifically, during the process of fermentation, enzymes break down the sucrose molecules into glucose and fructose, which can then be fermented by the yeast and converted into alcohol and carbon dioxide. In addition to contributing to the body of the wine, higher alcohol levels also bring out the intensity of the fruit. There is a straightforward link between the sugar content in the fruit and the resulting alcohol level in the wine. Look at the table below. For a wine with 13.0 percent alcohol, for example, one needs grapes at the 90 degrees Oechsle level. This would be a bone dry wine. 90 degrees Oechsle is well beyond the Spaetlese category and high up in the Auslese category. Thus, all of Germany’s Spaetlese wines and most Auslese wines, if left to mother nature only, should be dry. You have to go beyond that - say 110 degrees Oechsle - for the fermentation to stop naturally and sugar to remain in the wine. More general, all German wines up to the Auslese category are potentially bone-dry. Once we move above to the Auslese to Beerenauslese, Trockenbeerenauslese and Eiswein, the fermentation stops naturally and sugar remains in the wine. This are Germany’s flagship noble-sweet wines. First, in reality you have sweet German wines that are below Auslese level. First, stopping the fermentation; this is typically done through a skillful manipulation of the fermentation process with sulfur and temperature control. The winemaker needs to follow closely the fermentation process and must make sure that it comes to a stop at the desired level of sweetness. Second, the other technique is to let the wine first fully ferment and then add to the dry and fully fermented wine sterilized grape juice (called in German "Suessreserve"). Here the winemakers lets the wine fully ferment to produce a dry wine and then experiments with different amounts of Suessreserve to achieve the desired level of sweetness in the final product. Ideally, the Suessreserve comes from the same wine. It needs to be sterilized so it does not begin to ferment after it is added to the wine. Thus, any German wine ranging from Tafelwein to Spaetlese/Auslese is dry, unless the winemaker decides otherwise. If he or she does so, he or she can either arrest the fermentation or add Suessreserve. A good indication if a sweet Spaetlese was stopped or not is the level of alcohol. If it is low, the likelihood is large that the wine was made sweet by arresting the fermentation. In recent years, adding Suessreserve has become the preferred method. Second, the noble sweet wines. Second, the frost late in the year, which also removes the water in the grapes when the temperatures fall (but does not produce the botrytis taste). In both cases, the sugar content of the grape is exceptionally high at the time of the harvest and mother nature is unable to ferment all the sugar. Thus, natural sugar remains in the wine and makes the wine sweet. These are the famous sweet dessert wines in Germany: Beerenauslese, Trockenbeerenauslese, Eiswein. Third, chaptalization is legal and normal. Chaptalization is legal and normal, but only for wines in the Tafelwein, Landwein and QbA categories, which accounts for about 60% of German wine. From Kabinett wines upwards, chaptalization is not allowed. It is obvious that chaptalization is not a means of increasing the sweetness of the wine but of the alcohol content, as in neighboring France. For Deutscher Landwein, for example, the fruit must have at least 47 degrees of Oechle in the Mosel valley. To reach a sufficient alcohol content, the must needs to be chaptalized. Its sole purpose is to increase the final alcoholic strength of a wine - the added sugar (along with the grapes' natural sugar) is converted during fermentation. The EU wine law limits the amount of additional alcohol that can be achieved through this cellar technique to 3.5% by volume and 2.5% by volume, depending on the wine region. The basic rule is that 100 grams of sugar per liter increases the alcohol content of a liter by 0.66 percentage points. 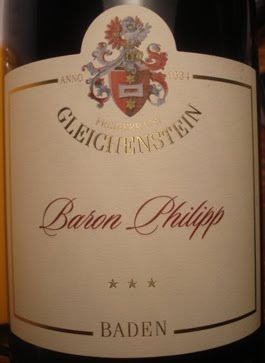 The Baron von Gleichenstein is currently one of Germany’s hot wine makers. He is this year’s shooting star of the renowned Gault Millau Wine Guide Germany and he won the prestigious Pinot Noir Award of the wine journal VINUM. See here and here. The Gleichenstein Estate was founded in 1634. However, it is only in recent years that the Estate has taken off under the young Baron Johannes von Gleichenstein. "Increasingly, he uses the great potential of the prime locations in Oberrotweil for excellent Burgundy,” editor Joel Payne of the Gault Millau praised the Gleichenstein wines. With his 2007 Pinot Noir, Gleichenstein moved into the top range of German red wines, and with his Pinot Gris from the Oberrotweil Henkenberg into the top range of German whites. Baron Johann von Gleichenstein, the eleventh generation on the Estate, has been the head of operations since 2003. His father, Hans-Joachim Freiherr von Gleichenstein, took over the business in 1959 as a mixed farming outfit and transformed it into a pure wine making operation. The Estate is located in the Kaiserstuhl region in Baden, the southernmost German wine-growing area, across the Rhine river from Alsace. The Kaiserstuhl region is known for its Pinot wines - both red and white. Katharina Schiller, Restaurant Venus, Berkeley, USA. The prices are in Euro at the winery in Germany. The exchange rates ares currently BP 0.88 = Euro 1 = US$ 1.41 Where no price is indicated, the price was not available. A blend of Pinot Blanc and Chardonnay. Methode Champenoise extra brut – many of Germany’s top wine makers produce one or two sparklers to round up their wine portfolio. These Sekts tend to be very well made, of course in the Methode Champenoise. In terms of dosage, this is an extra brut (= brut de brut) which can have up to 6 gram remaining sugar per liter. Tasting notes: Numerous small and fine bubbles topped by succulent mousse reveal the noble character of this sparkler even before tasting it. On the palate, this Sekt displays a convincing intermezzo of refreshing fruit and vibrant steeliness. In a traditional German flute bottle with a screw top. Müller-Thurgau is a cross of the Riesling and Silvaner grapes, created by Hermann Mueller from the Swiss Canton of Thurgau in 1882. It matures early and tends to be a high yielder. QbA trocken – a dry Qualitaetswein bestimmter Anbaugebiete (QbA) wine where the grapes had a sugar level at harvest that allowed the wine maker to chaptalize the wine, not to increase the residual sugar level, but to increase the alcohol level to 11.5 %. Hofgarten - deep soil from eroded loess and weathered volcanic rocks. Tasting notes: in the glass, straw yellow with green shades. A wave of tropical fruit on the nose, a light-bodied wine with green apple, citrus and floral aromas. This is a pleasant party wine with surprising lip-smacking acidity on the finish. Mueller-Thurgau wines are generally simple everyday wines and this is a prime example of such wines. In a light Bourgogne bottle with a screw top. Grauer Burgunder - Pinot Gris or Pinot Grigio - is a white wine grape thought to be a mutant clone of the Pinot Noir grape and has a grayish-blue fruit. It is enjoying a wave of popularity in the US. Kabinett trocken - a dry premium wine, where chaptalization is not allowed and the alcohol content (13%) is the result of the sugar in the grapes at harvest. Tasting notes: Lemon yellow with a shade of copper-pink in the glass, floral bouquet, a medium bodied wine with hints of pear and apple aromas. Good structure, satisfying and soft finish. Weisser Burgunder – Pinot Blanc: Historically a popular grape in the Bourgogne and the Champagne, but now widespread in Alsace, which is on the other side of the Rhine valley from the Estate. Kabinett trocken, with 13% alc. Tasting Notes: Light straw yellow in the glass, hints of green apples and peaches on the nose, a medium-bodied wine with refreshing and fruity aromas on the palate, including ripe pineapple, apricots and pears, and with a lingering finish. In a German flute bottle with a screw cap. Muskateller - an exotic grape: This fragrant grape probably originated in Asia and is considered to be one of the oldest existing varietals. Barbarossa, who reigned as Roman Emperor from 1155 to 1190, appreciated this wine and it is also mentioned in the Nibelungenlied (The Song of the Nibelungs), which was written during this period. It now accounts for just 1 % of the cultivated vineyards in Germany. Spaetlese trocken (13.5 % alc.) - has a somewhat higher sugar content at harvest than Kabinett trocken and cannot be chaptalized. Oberrotweiler Eichberg - a vineyard with a lot of exposure to the sun. The soil consists of weathered volcanic rocks. Tasting notes: straw-yellow with green shades in the glass and beautiful legs, burst of white pears, pineapple, papaya and fresh lime on the nose, a full-bodied and hot wine that ends on a note of green apple with a light fizz. In a light Bourgogne bottle with cork. Spaetlese trocken (13.5 % alc.). Oberrotweiler Henkenberg - The name derives from the vineyard’s being the former site of the manorial gallows. The south-facing vineyards comprise 53 hectares of volcanic weathering soils (ash and tuff) with basalt layers. Tasting notes: dark straw yellow in the glass, a bit timid on the nose, spritzy and a hint of sweetness on the palate, very crispy with hints of kiwi, good acidity, with a hot, almost spicy, finish. In a light Bourgogne bottle with a cork. Spaetlese trocken (14.5 % alc.) - this is close to the upper limit for the alcohol content of a wine; if you want to go beyond that you would need to fortify the wine. Tasting Notes: A wine that, initially, timidly displays its greatness, but when opened up shows great promise. Full bodied with a lot of lime and citrus, high in alcohol, but very elegant. A hint of petrol adds to its attraction. When open for a while, it blossoms into honeydew melon flavors, with a hot and spicy finish. In a heavy Bourgogne bottle with a cork. Barrique - The barrique is a wooden barrel with a capacity of 225 liters. The longer a wine spends in the barrel, the more of the oak flavor it will take on. There are dozens of other barrel shapes and sizes. Tasting notes: dark straw yellow in the glass with legs that won’t quit. An attack of mango and Caribbean rum on the nose- you feel like you’re inside a Gauguin painting. A full bodied wine, it elegantly combines the wood with fruit and lots of spices. Spaetlese trocken (13 % alc.). Tasting notes: Showcases the best aspects of an old world style Chardonnay - very different from Napa Chardonnays. Attack of vanilla, cinnamon and cloves on the nose, hint of mashed bananas, musky on the palate, with a hot and spicy finish. In a light Bourgogne bottle with a screw cap. Spaetburgunder - In Germany, the Pinot Noir is called Spätburgunder. It is to red wine what the Riesling is to white wine: the cream of the crop. In the US, Pinot Noir shows great promise in Oregon and California. The reputation that gets Pinot Noir so much attention, however, is owed to the wines of the Bourgogne in France, where it has probably been cultivated since at least the 4th century (first documented, however, in the 14th century). Regardless of where it’s grown, Pinot Noir is not typically a value wine. That is because Pinot Noir is such a delicate grape that it is difficult and expensive to grow and make into the spectacular wine it can be. It is very sensitive to climate and soil. Pinot Noir needs warmth (but not intense heat) to thrive and does well in chalky soils. As the German name implies, it ripens late (spät). QbA trocken (13 % alc.). Tasting notes: Light ruby-red in the glass with nice legs, you smell wet leaves with strawberries, a light-bodied wine with plenty of red fruit on the palate, dry, acidic finish. A pleasant autumn wine. Oberbergener Bassgeige - a premium single vineyard, which consists of black volcanic rock. QbA trocken (13.5 % alc.). Tasting notes: Light ruby red in the glass with beautiful legs, immediate attack of stewed red fruit, chocolate and grilled bread on the nose, a delicate medium bodied wine with a note of spices on the lingering finish. Tasting notes: Light ruby-red with thick legs on the glass, red fruit flavors with earthiness and minerality on the nose. A medium to full-bodied, beautifully balanced wine: has the fruit –with a hint of Malagasy vanilla - but the tannins as well. A very well rounded Pinot Noir. QbA trocken at 14% alc. Tasting notes: Attack of oranges and honeysuckle on the nose, light velvet mouthfeel with beautiful legs in the glass. A full-bodied wine with hints of blackberries and vanilla, on the palate it is meaty and jammy without being too overloaded with fruit, with a soft and well-rounded finish. A German flute bottle with screw cap. Kabinett feinherb at 11 % alc. - a Kabinett wine (that means it was not chaptalized) that is “feinherb“ meaning 18 to 45 grams remaining sugar per liter. A wine that should fully ferment, as did the other Kabinett wines in the tasting, so sterilized juice was potentially added to achieve the desired level of remaining sweetness. Tasting notes: Attack of lush, opulent orange peel and passion fruit. A medium-bodied, very aromatic wine with bursts of papaya, pineapple, sweet white peas and passion fruit, as well as notes of ylang-ylang and over ripe Malagasy litchi. Nice interplay of sweetness and acidity, thick legs. Beerenauslese at 7.5 % alc. - The flagships of German wines are the noble sweet Beerenauslese, Trockenbeerenauslese and Eiswein. There is nothing you can do to prevent these wines from becoming noble-sweet. They are made either from botrytised grapes (the first two) or grapes that were harvested during frost. More specifically, in the first case, the fog in the autumn mornings at German river banks produces a fungal infection, botrytis cineria (noble rot), which removes the water in the grapes and adds a unique flavor. In the second case, the frost late in the year removes the water in the grapes when the temperatures fall (but does not produce the botrytis taste). Tasting notes: A concentration of nature, golden, thick in the glass with legs that won‘t quit. Attack of guava, honey, overripe pineapple and pear as well as Malagasy litchi on the nose, velvety mouth feel. This jewel on the basis of a non-traditional grape does not have the acidity that you can expect from a Riesling Beerenauslese, but is almost obscenely sweet, with a never ending, spicy finish. There is a red wine boom in Germany. The share of red wines in terms of production has increased from 10 percent in the 1980s to about 35 percent now in Germany. Of course, given its location, the German red wines tend to be not like the fruity red wines we know from warmer countries, but lean and more elegant, with a lot of finesse. 30 years ago, in the international scene, people would not talk about German red wine. But this has changed. Germany now produces red wines that can compete with the best of the world. The red wine boom has not yet reached the US and it is very difficult to find these wines in the US. 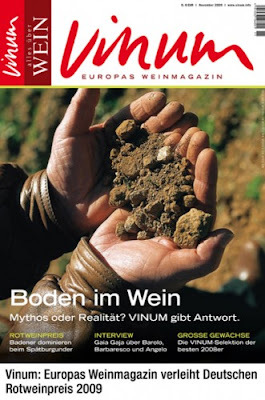 Since 1987, the German wine magazine “VINUM” organizes the "German Red Wine Award". For the last contest, which took place at the end of 2009, 1270 wines were submitted. The list of winners looks a bit unusual. The really big names of the German red wine boom are missing. Rather, one finds young, new winemakers, many from Baden and Württemberg; the winner in the Pinot Noir category is even a wine cooperative, along with a wine from Baron von Gleichenstein. I reviewed a von Gleichenstein Estate wine here. In a restaurant you first choose the wine and then the food that goes with the wine? John Brunton from the Observer in the UK claims that this is the new trend in Paris. I doubt it. I could see this happening in Berlin, London or Washington DC, but not in Paris. In my view, for the French the food will remain at the heart of an evening in a restaurant. He or she may have some wine already in mind, but they will always choose the menu first and then in the second step the wine. Nevertheless, there are a number of new restaurants in Paris were choosing your wine is very important, apparently more than what you decide to eat. These restaurants look extremely interesting. Here is the list. I post it on my Schiller Wine Blog so I have it handy next time I am in Paris. 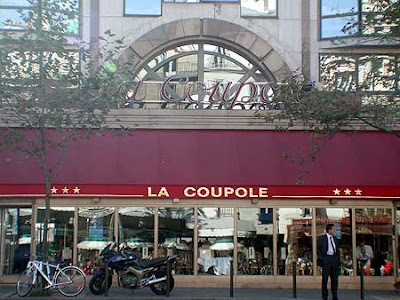 My favorite however will remain La Coupole, a large, famous and lively Brasserie in the 15th Arrondissement, 102 Bd Montparnasse, Rive Gauche. It is nothing special, just good; and has been like that for many decades. It belongs to the Flo group, which operates many other famous Brasseries, of which I like in particular Le Vaudeville, near the stock exchange, and Julien in the 1oth. The latter has a spacious simple bar were I often had a "ballon de rouge" after work when I used to live in Paris. A new generation of bars and restaurants are making the wines even more important than the food – and putting the accent on informality and value. The Michelin Guide shocked the Parisian world of gastronomy when it gave one of its latest stars to a restaurant that had been open just three months. Not only was this unheard of, but Il Vino, the brainchild of Enrico Bernardo, voted best sommelier in the world in 2004, makes choosing your wine the most important thing, rather than what you decide to eat. Guests open the "menu" and find 30 different wines listed by the glass. You select your wines and the chef prepares dishes to match them, with each course a surprise. Il Vino is part of an exciting trend in the French capital, where wines are the stars of a new bar and restaurant culture. And these are not just any old wines – rather than classic Bordeaux and Burgundy chateaux and grands crus, you'll find vins naturels, exciting new organic wines. These wines come from vineyards that have not used pesticides, and the artisan winemaker has resisted the temptation to add sulphur or sugar, or use filtration. Natural wines can have a revolutionary taste and a completely different look – they may be cloudy or have bubbles that disappear only when the carafe is shaken. These new restaurants tend to be casual, friendly and reasonably priced, a welcome change from some of the capital's stuffy gourmet restaurants. A three-course set meal might cost around €25 or a filling plate of cheeses and cold cuts €10-12. Then it's up to you how much you want to splash out on the wine. Most of the places double as wine shops. Here are eight of the best places. Montmartre is one of Paris's most contrasting neighbourhoods, where you can wander from touristy areas such as the steps of the Sacré Coeur into the hippest bars and restaurants. Cafe Burq is definitely in the second category, attracting a fashionable clientele who enjoy a fine selection of organic wines. Chef Laurent Cardillac creates delicious eclectic dishes such as foie gras pan-fried with figs and honey, or pig cheeks cooked in a miso broth with chanterelles. Open till 2am, this is also a great place for a late-night glass of wine. Young Parisian sommelier Guillaume Dupre has created a wonderful wine bar in the heart of the tourist trap of St Michel. There's an old-fashioned zinc bar, and an ancient vaulted cellar transformed into a dining room. Try "Red Bulles" or "Maudi-Bulles", bubbly Gamay wines that make a fun change from rosé champagne. The cuisine is a mix between exotic fusion – imagine whelks with wasabi mayonnaise – and traditional rural food, from wood-smoked pork to a lethal camembert. Tucked away in a narrow side street not far from the Louvre, "The Wardrobe" is run by two female sommeliers – Nathalie from France and Robin, a New Zealander. The shelves and cellar are stacked with more than 200 different wines. There is no official wine list, and Nathalie and Robin are happy to open pretty much any bottle and serve the wine by the glass. If you want to sit down and enjoy the whole bottle, you pay €7 corkage on the takeaway price. At lunch there is a €10 plat du jour, while at night, customers feast off €12 plates of charcuterie and cheeses. The Passage des Panoramas (off boulevard Montmartre) is one of Paris's hidden secrets, a beautiful belle époque shopping arcade. And tucked away inside, there is another discovery waiting to be made: the romantic Racines bistro, opened by sommelier, Pierre Jancou. The restaurant's staff are evangelical about vins naturels, working with only 15 producers deemed worthy. There is also an excellent young chef, whose menu changes daily, with hearty dishes such as braised beef cheeks, followed by an irresistible gateau au chocolat. Although the Canal Saint-Martin has recently become one of the hippest neighbourhoods in Paris, Cyril Bordarier was well ahead of his time when he launched the Verre Volé here eight years ago, and today it is an institution for anyone interested in discovering the world of organic wines. The Verre Volé could win a prize for the tiniest kitchen in Paris, and Cyril's secret is that he has a deal with one of Paris's finest butchers, who prepares dishes such as roast chicken with aubergine purée that just need to be reheated for serving in the bistro. Olivier Camus is the spiritual guru behind the trend in vins naturels in Paris. Twenty years ago he opened Le Baratin, the first bistro in Paris to champion organic wines. Then came Le Chapeau Melon (The Bowler Hat), originally just a wine shop, tucked away in Belleville. Today he has gone back into the kitchen, and operates an interesting table d'hôte system in the evenings – a no-choice three-course meal, featuring tasty dishes such as roast lamb served with cocos, white beans from the Breton port of Paimpol. The choice of natural wines is spectacular, but with corkage at €8.50, plus the €31.50 for the set dinner, don't expect a cheap evening. Reserve well in advance. This is one of those addresses that everyone dreams of discovering in Paris. La Crèmerie began life in 1880 as a dairy, and the interiors are unchanged today – counters made of slabs of marble, ancient wooden fridges, a fabulous pastel ceiling fresco painted on silk. In 1947, it became a cave à vins and, three years ago, architects Serge and Helene Mathieu took over. In the heart of the Quartier Latin, it has just enough room for 12 people to sit down, plus four stools at the bar. There is no kitchen for hot dishes; the specialities here are tapenade, sardines and anchovies, saucisson and smoked ham. Autour d'un Verre resembles an ancient bistro that has been here for generations, but in reality, this used to be an internet shop that American restaurateur Kevin Black converted into a bar à vins. He is a self-trained chef and passionate fan of natural wines. His cuisine is classic French comfort food – cod roasted with aubergine and courgettes, a fabulous Montbéliard sausage with mashed potatoes. Although you eat well, and at very reasonable prices, Kevin admits that his real passion is wine, and the lengthy list is a reflection of his travels around France searching out producers of natural wines. Be sure to ask him to recommend one of his latest discoveries. In Germany, the Pinot Noir is called Spätburgunder and is to red wine what the Riesling is to white wine: the cream of the crop. In the US, Pinot Noir shows great promise in Oregon and California. The reputation that gets Pinot Noir so much attention, however, is owed to the wines of the Bourgogne in France, where it has probably been cultivated since at least the 4th century. Regardless of where it’s grown, Pinot Noir is not typically a value wine. That is so because Pinot Noir is such a delicate grape that it is difficult and expensive to grow and make into the spectacular wine it can be. It is sensitive to climate and soil, Pinot Noir needs warmth (but not intense heat) to thrive and does well in chalky soils. As the German name implies, it ripens late (spät). Bill Dailey from the Chicago Tribune tried to do a contest between Pinot Noirs from California and Oregon, using such tools as facebook and twitter. "In general, the Oregon pinots were lighter in color, fruitier in the nose and cleaner on the palate than the Californians, which were dark, smelled more like hay and mushrooms and had more powerful fruit." Interestingly, California came out as winner. Here are the wines that he included in the contest and his assesments. Bill Dailey’s full article is here. The wine journalist Randy Caparoso, who I admire very much, took issue with this article: But as someone who makes a living doing these comparisons, I have to say this: you could select three different Oregon pinot noirs and three different California pinot noirs for another smackdown, and easily come up with the opposite conclusion -- that Oregon pinots are darker, having more powerful fruit and smell earthy, whereas California pinots are lighter in color, fruitier in the nose and "cleaner" (whatever the hell that means) on the palate. The growing conditions and winemaking styles that produce these differences in the two states have become so numerous and varied, it has become virtually impossible for even experienced pinot "experts" (this word, always a state of mind), much less average pinot lovers, to make out the differences in "blind" or "double-blind" tastings. In fact, it's been like that for well over ten, nearing twenty years now: pinot noirs in both California and Oregon are more varied and sophisticated than ever! So why report that one might be "better" than the other? Here is Randy Caparoso’s full article and here is the very interesting second half of it. 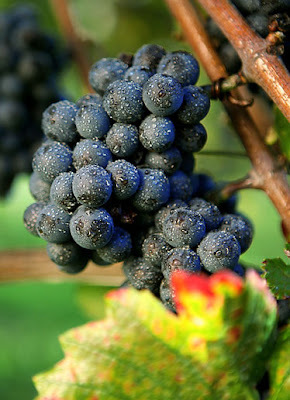 Pinot noir has become synonymous with the relative cool climate grape growing regions of the Willamette Valley AVA (i.e. American Viticultural Area), stretching along the Oregon coast from Portland to Eugene; and consumers can now look forward to the more serious releases from the rainy, thus oft-maligned 2007 vintage. The better producers, says Penner-Ash winemaker/proprietor Lynn Penner-Ash, shouldn’t be “penalized” because “some winemakers can’t make wine in a cool, wet year.” As one of Oregon's most respected vintners, Penner-Ash pulled out all the tricks learned from her twenty-plus years in the Willamette, picking before, during and after the rains that persisted throughout the month of October. Her pièce de résistance and top-of-the-line, the 2007 Penner-Ash Pas de Nom, is simply amazing – plush, powerful, exotically scented. For Joshua Bergström, the 2007 vintage was more a matter of patience and circumstance. “We waited six weeks from the time the rains started,” says Bergström, picking towards the end of November. For Bergström, Biodynamic® growing also is the difference. Less dependent upon “chemical diet,” Bergström’s plantings retain acidity, minerality and depth, with lower alcohol, in both “cold and hot vintages,” as evidenced by the deep, generous, pliant 2007 Bergström Dundee Hills Pinot Noir. For the dry farmed, Biodynamic® certified Brick House Vineyards, according to proprietor Doug Tunnell, 2007 was “the most aromatic vintage in memory… during the harvest the entire winery smelled like a candy confectionary,” resulting in pinots like his 2007 Brick House Ribbon Ridge Pinot Noir: hauntingly perfumed, in the fine, delicate style associated with this estate. Is it a coincidence that other Biodynamic® producers were so successful in the challenging conditions of 2007? The 2007 Beaux Fréres Upper Terrace Pinot Noir is tasting like a banner year (certainly, among the winery's finest vintages ever): a silk tapestry of spiced strawberry and smoke. More proof-positive that you should never pay attention to premature, knee-jerk vintage assessments of the establishment wine press (i.e. dumb, de dumb, dumb); but rather, wait for the wines to actually go into bottle before tasting them, and drawing your own conclusions. Further south in Willamette Valley's Eola-Amity Hills AVA, winemaker Isabelle Meunier (pictured just above) describes her deep rooted Seven Springs Vineyard (owned and managed by Evening Land Vineyards) as “bullet proof… impervious to rain, unaffected by heat.” The 2007 Seven Springs La Source Pinot Noir was picked during “good days” at the start of the October rains, yet few pinots from anywhere, any year, are as fine and luscious, bursting with wild raspberry, anise, rose petal and blueberry jam. Yet, not to be undone, the single vineyard Eola-Amity Hills bottlings by Cristom’s long respected winemaker, Steve Doerner, are also wildly successful; epitomized by the 2007 Cristom Jessie Vineyard Pinot Noir, a sweet, electrifying mix of red and black berry fragrances, smoky spices, dried cherry skin, and savory, gripping, round and muscular textures. But Oregon is not only about Willamette Valley. There are, in fact, a number of bright, effusive 2008 Pinot Noirs coming out of Southern Oregon (an AVA lying south of Eugene, extending down towards Cave Junction and Ashland along the California border) now entering the market. Del Rio Vineyard’s bright, youthful new winemaker, Jean-Michel Jussiaume (pictured just above), produced a 2008 Del Rio Pinot Noir that is lithe and flush with wild raspberry and strawberry, reflecting a loose-cluster year, lightened by a poor spring set. In Illinois Valley, in the far western reaches of Rogue Valley, Ted Gerber says his higher elevation Foris Vineyards never have “acidity issues.” In ’08, a “fabulous fall” ushered “ripening all the way through October,” yet allowed for picking at lower sugars (i.e. moderate alcohols). The 2008 Foris Maple Ranch Pinot Noir is alive with berryish fruit, yet deep, tight, compact. A few weeks ago, I tasted the Pinot Noirs of Soter Vineyards from Oregon. Here are my tasting notes , which I have been published previously here. Soter Vineyards is in the Willamette Valley, were about two-thirds of the state's wineries and vineyards are. Buffered from Pacific storms on the west by the Coast Range, the valley follows the Willamette River north to south for more than a hundred miles from the Columbia River near Portland to just south of Eugene. It has been recognized as one of the premier Pinot Noir producing areas in the world, although it is still a young wine growing area. Pinot Noir has been planted in Oregon for a bit more than 40 years only. Sater Vineyard lays at the 45th parallel of latitude, just about on par with Burgundy some 6,000 miles to the east. 2007 Soter Pinot Noir "North Valley", a blend of Pinots from both Estate-grown fruit and also grapes purchased from some of Tony's esteemed neighbors, medium-ruby colored, attack of strawberry and pain grille on the nose, very delicate and lean on the palate, long note of spice on the finish, a typical cool-climate Pinot Noir, the North Valley wines are mostly aged in previously used French Oak cooperage. 2006 Pinot Noir Beacon Hill Vineyard, medium-ruby colored, attack of concentrated dark red fruit and dark chocolate note on the nose, coupled with wet leaves, spicy wild berries, deep fruit aromas on the palate that lasted through a long finish. 2006 Pinot Noir Mineral Springs Vineyard, medium-ruby colored, beautiful nose with a wave of spice, earth, and strawberries, soft and silky on the tongue, with an a lasting spicy light-tannin finish. All three Pinot Noirs are very approachable, but could improve with bottle age for several years. However, these are clearly not wines that are not drinkable now and need several years of maturing to display all their brilliance. They do that now already. The wines reminded me of top German red wines that are increasingly appearing in the American market. Germany also is an area —- like Oregon --- where people used to say, it does not work for red wines, but now produces extremely elegant red wines with a lot of finesse. I tasted three Pinot Noirs from Aloxe Corton in the Bourgogne/France, from Santa Lucia Highlands in the US and from Hochheim in the Rheingau/Germany recently. Here are the tasting notes, which have been posted on the Schiller Wine Blog previously. Christian G.E.Schiller in Hochheim/Germany - Wickerer Koenig Wilhelmsberg. Interestingly, the French wine does not mention the grape variety on the label, but the village in which the wine is grown and made is printed in fat letters, with the exact appellation below it; for the American wine it is just the opposite: the grape is printed in fat letters. Well, the focus in the old world is clearly on the terroir. Terroir is a French concept involving the complex combination of micro-climate, geology, topography and soil that determines the taste of a wine. The classification for Aloxe Corton groups all wines into four different groups. Terroir is on the back burner in the new world. The focus here is on the grape variety. All three wines were great. The American Pinot Noir was purple red in the glass--a deep red wine. An amazing attack of concentrated dark red fruit and dark chocolate note on the nose. Spicy wild berries, deep fruit aromas on the palate that lasted through a long finish. The French Pinot Noir was 10 years older and a bit on the brownish side in the glass, but still very fresh and at its height. Smoke and wet leaves on the nose, typical for the Pinot Noir. In the traditional French style of a Pinot Noir, it was lighter in color and body than its counterparts from the warmer climate in California. The German Pinot Noir was a Spaetlese trocken, thus had elevated sugar content at the harvest, but was fully fermented and became a bone-dry wine, like the French and American counterparts, with 1.3 gram sugar/liter. Koenig Wilhelmsberg is a vineyard in neighboring Wicker, which is in Alleinbesitz, that means Hueck is the only winemaker who owns that piece of land. Smoke on the nose, even lighter in color and body than the Aloxe Corton, but not in terms of tannin and acidity. The International Wine and Spirit Competition is an annual competition, which many wine experts consider to be the premier of its kind in the world. At the heart of it is a rigorous two-stage judging process of professional blind tasting and detailed technical (chemical and microbiological) analysis that takes place at the Competition's headquarters in Surrey, UK. The Competition is backed by a group of most influential men and women in the trade. The VdP - Verband Deutscher Praedikatsweingueter issued a press release indicating that Michael Prinz zu Salm-Salm has been elected President of the International Wine and Spirit Competition. See below. I have tasted Salm-Salm wines recently and my tasting notes on a Salm-Salm wine follow. Press Release VdP: Michael Prinz zu Salm-Salm, honorary president of VDP, is elected president of the International Wine and Spirit Competition. It is a great honor since the competition is backed by a group of vice presidents made up of the most influential men and women in the trade, including Baroness Philippine de Rothschild, Miguel Torres, Marchese Piero Antinori, Robert Drouhin, Robert Mondavi, May de Lencquesaing, Kenneth Graham and Sir Anthony Greener. Prinz Salm was born in 1953 to the distinguished Salm-Dalberg family, one of Europe's oldest and most venerated. Since the time of Charlemagne, for more than a thousand years, the family heritage has been tied to the land, with interests and holdings in forestry, agriculture and wine. Prinz Salm-Salm's great love is wine, and he takes an active role in the two estates controlled by his family. The Prinz Salm Dalberg'sches Weingut in the Nahe, dates back to A.D. 932 and is reputedly the world's oldest estate remaining within one family. In addition to the wineries, Prinz Salm-Salm is founder and managing partner of Salm-Salm & Partner GmbH, an investment and real estate consulting company. Among various duties and honorary positions he is also chairman of the Association of Land Proprietors in Germany and President of the Association of German Forest Proprietors. Schloss Wallhausen is one of Germany's oldest wine estates. Prinz zu Salm, the estate owner and current president of the VdP (Association of Prädikat Wine Estates), can trace his family tree back to 932 and his vineyards to 1200. “Two Princes” P2 is the signature wine of Prince Michael and Prince Constantin zu Salm-Salm, members of the 31st and 32nd generation of winemakers at Schloss Wallhausen. The Nahe vineyards are scattered among the fields and orchards of the Hunsrück hills and the Soonwald forest along the Nahe river, situated between the Rhine and Mosel valleys. Affordable easy drinking wine from one of Germany’s oldest wine estates with a light sweetness. Light gold in the glass. Flavours of tropical fruit with a crisp finish. Japan: Sake or Koshu wine?